Ageless Mobility® is an easy-to-learn, follow-along, low-impact, instantly-effective movement program involving a scientific blend of dynamic mobility combined with simple flowing yoga. 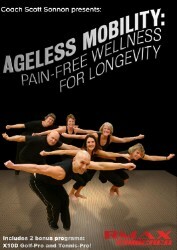 Ageless Mobility® gives you pain-free quality of life, and the ability to move gracefully, effortlessly and play without the dreaded "day after pain." Ageless Mobility® is a program from the Circular Strength Training® System, a scientific “3 winged” System, which focuses on "prehab and post-rehab". This program is designed in a genetically-programmed sequence of lubricating each joint, one after another, until the entire body becomes fully flushed with nutrition. Most people suffer through their lives literally starved for this critical movement! Once each joint is well oiled and ready to move, then soft, flowing yoga movements, easily learned, release the body of chains of tension. This specific process helps prevent daily aches and pains while helping abate the onset of shoulder bursitis, elbow tendonitis, carpal tunnel syndrome, neck and lower back disc herniation, hip, knee and ankle strain. The simple breathing exercises manage stress at a biochemical level while increasing core strength and helping gastrointestinal health. It can be performed once or twice a week for 45 minutes and still receive 100% of the medical benefits of the exercise. In the time that most people channel surf throughout the day, any Boomer, anyone of any age for that matter, can again have that energetic zeal of pain-free mobility wellness! NOTE: Please be sure to include your email address when ordering this audio file. When you have completed your order, RMAX will send an email, to the address you have specified, with instructions for downloading your purchase.